It was an idea we had played with before, with various degrees of facetiousness and seriousness. This time, though, I figured he meant it. “Put him on the phone,” I said. “In the ground?” I asked. Over the course of the next week we worked through the practicalities, logistics and costs. We would have to dig the pit, line it with big river rocks, banana leaves and burlap sacks beneath Miss Piggy. On top of her we would have to repeat the banana leaves and burlap before closing the pit with sheet metal topped with dirt. When we started adding up the cost – in dollars as well as back pain – it began to seem prohibitive. “Or, I said, “we could get a roasting box.” I’d read about these things: wooden boxes lined on the inside with metal, the top closed with an ash pan and charcoal grid. The charcoal rests on the top of this roasting box, above the charcoal grid. This method allows the meat to become moist and tender within 4 hours – instead of the minimum 8 for the pit – because of the oven-like effect of the enclosed cooking area. And one significant bonus is the simple, undeniable fact that where the pit would be a one-off affair (and expenditure), for slightly more money (purchase and shipping) we would have the roasting box available for repeat duty. The most famous brand name in the roasting box game is “La Caja China” (a reference to the fact that the design was used by Chinese workers in Cuba). A less expensive, but essentially identical, unit is called “Caja Asadora” and is available at www.shoplatintouch.com. One telephone call later and Miss Piggy’s fate was decided. 1. Make the Mojo Criollo. Combine the Mojo Criollo ingredients in the bowl of a food processor and process to a consistency reminiscent of a wet pesto. Refrigerate the resulting marinade for at least one hour. Strain the marinade well, reserving the solids. Inject it into the pig, 5-6 shots from the syringe into each rear leg and 4-5 shots into each shoulder. This is best done the night before it is to be cooked. 2. Rub the Pig. Combine all of the Spice Rub ingredients in a large bowl and mix well. Rub the pig by hand all over with the spice rub. This too is best done the night before it is to be cooked. 3. Prepare the Roasting Box. Place the grease tray inside the roasting box. Place the room temperature pig in between the grids, on its back, pour the solids from the mojo criollo in the cavity, and place the pig in the grease tray. Close the roasting box with the ash pan and charcoal grid. Allow 4 inches of separation between the pig and the ash pan. 4. Prepare the Charcoal. Starting with 16 pounds of charcoal in two 8 pound piles on each end of the charcoal tray and light using lighter fluid or, better yet, a wax-based starter. When the charcoal has been lit for 15 minutes, distribute it evenly and throughout the tray. 5. Roast the Pig. Roast the pig for 3 hours. Keep the roasting box closed at all times (except for opening to turn the pig as in step 6). After 2 hours, add 7-8 pounds of charcoal over the top of the existing coals. 6. Crisp the Skin. After the pig has roasted for three hours, turn it over and score the skin every 4-6 inches. Meanwhile, dump the ashes from the ash pan. Return the ash can and and charcoal tray to the roasting box with new charcoal and continue roasting. Check the skin after about 20 minutes, by opening the box at one of the corners. Repeat until the skin is crisp. 7. Serve. Present the pig for serving while watching for the intriguing reactions of those around you. You guys did an absolutely outstanding job! 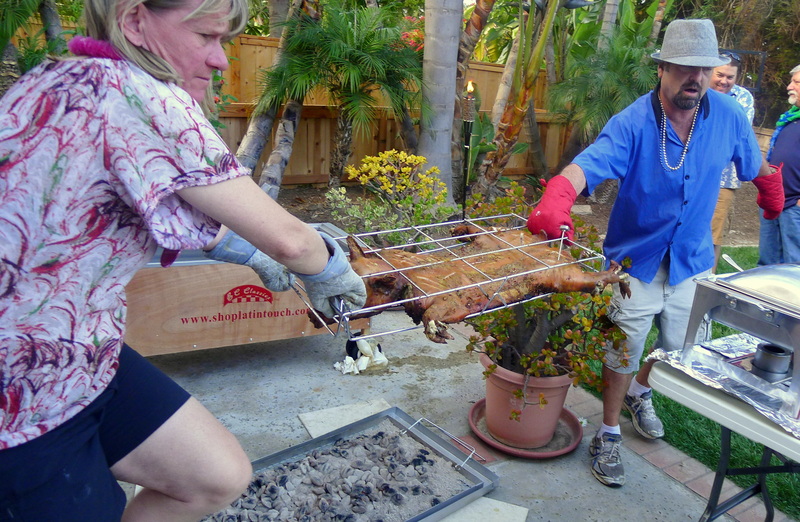 Nothing beats a pig roast for bringing together family and friends to celebrate! Looks like you had a blast. And awesome work on the recipe and instructions. Everything is right on the money. Its been an absolute pleasure getting to know your work! I’m doing this after reading this post. Looks amazing!